John Steinman was born in 1827 in the Duchy of Westphalia, later part of Germany. In 1849, he left Hamburg for America. On the ship, he met Adelaide Heller, who was with her parents, the Kopple Hellers. Adelaide had been born in Bavaria in 1836. John Steinman soon left New York for San Francisco, where he ar­rived on board the Falcon in 1850. He sent for Adelaide and her parents, and they were married in 1852. Adelaide was sixteen. The couple was married by an officer of Congregation Emanu-El of San Francisco, before it had a rabbi or a building of their own. Their wedding photograph is the first-known Jewish photograph taken in San Francisco. The Steinmans operated a series of hotels, beginning with Steinman’s Hotel on Pacific Avenue. They later had the New Atlantic Hotel at 181 Pacific, and, in the early 1860’s, operated the Revere House at 325 Pine. In 1871, the Steinmans moved into their home at 1827 Howard. Adelaide’s parents lived with them. This was one of the first homes in San Francisco with two bathrooms! 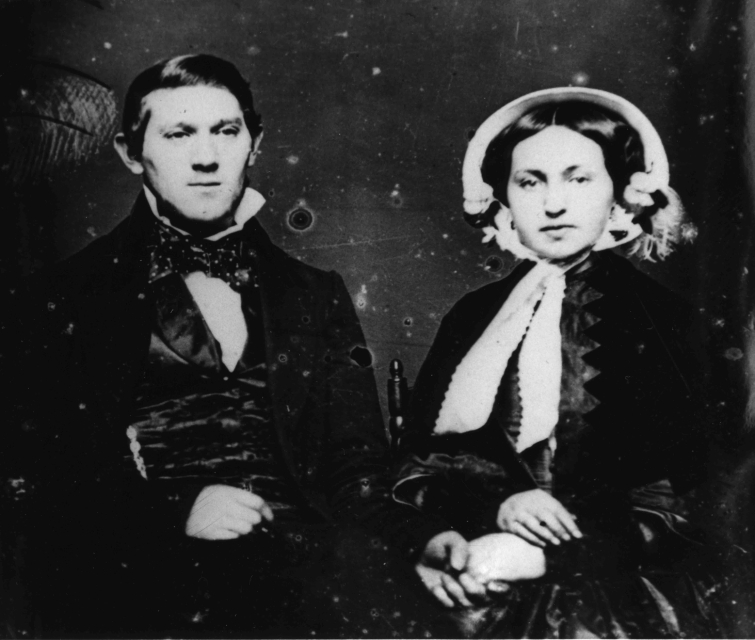 John and Adelaide’s first child was born in 1855. They would have two sons Adolph and Rudolph, and three daughters, Clara (Bloch), Jennie (Brandt), and Laura (Jacobs). Clara married French-born Achille Bloch, who arrived San Francisco 1871. John Steinman brought his younger brother, Bernard Ulmer Steinman, to California in 1858. Bernard lived with the family for a time before settling in Sacramento, where he was successful in business. In the 1880’s, Bernard Steinman became a Supervisor of Sacramento County, and in 1894 was elected Mayor of the City of Sacramento. John Steinman died in 1872. Adelaide Steinman passed away in 1888. Norton B. Stern, “John and Adelaide Steinman,” Western States Jewish History 41/2.